I graduated in 2014 with an undergraduate degree in optometry and went straight into a job as a pre-registration optometrist at Vision Express. I was working full-time whilst studying for my ongoing assessments and exams, which you have to undertake during your pre-registration. Yes! For the first six months at Vision Express I was all set to stay on once I was fully qualified. Earlier this year, however, I learnt of a PhD position back at the University of Plymouth in the optometry department. I applied for it and was accepted! I started my PhD in October and also became a fully qualified optometrist at the same time. I am now currently working full time as a PhD student. I work some weekends as an optometrist and I am also lucky enough to be a clinical demonstrator at the University. This means that I get to help out teaching the undergraduate students in their practical sessions. Making the decision to leave full-time employment as an optometrist and commit to three years of being a PhD student was a scary decision, as it is so different from anything I have ever done before. The first few weeks felt very strange as I transitioned from seeing patients every half an hour to sitting behind a desk instead! It certainly feels like the right thing for me to have done, but it was also a huge commitment and one that definitely cost me a lot of hours coming to the right conclusion. Be passionate about what you want to do because it gets tough at times; you need to be sure you have made the right decision. The undergraduate course is quite intense and you will be expected to work hard, but the course is also quite fun as you learn the different techniques. Get as much work experience as possible as this will make things much easier for you. Being an optometrist is hard work, but it is definitely very rewarding. 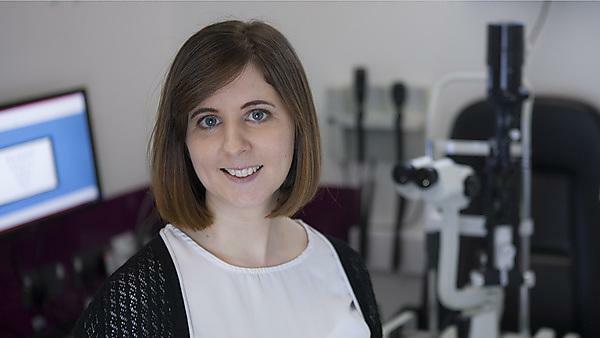 The BSc (Hons) Optometry course was new to the University when I first started and yet the staff were fully prepared for us and were, and still are, full of enthusiasm. The whole optometry team were keen for us to get as much clinical experience as possible, and they also wanted us to experience time in different optometric settings. This meant that we all got to experience what working as an optometrist was going to be like before we were thrown in at the deep end upon qualifying! Due to the amount of clinical time we got and the practical skills we spent so much time developing, I felt I was well equipped to start seeing members of the public and felt more confident in my clinical decision making. I always knew I would end up becoming an optometrist but Plymouth helped me to see that there are more opportunities out there. They helped me to get involved with extra activities such as a summer research project, which meant that I got to go to Barcelona for free! All these extra skills have made me want to achieve more and I already have a lot of connections to help me get there. I have found everyone who works at Plymouth to be friendly and helpful and never too busy to take a moment to chat to you or help you to sort out any problems. Plymouth helped to make my university experience a lot easier and a lot of fun! The team here at Plymouth are so supportive, friendly, and approachable: I couldn’t have asked for a better support structure. They made the whole experience a lot easier and it’s a pleasure to be back working with them again. For more information about studying optometry, please visit our BSc (Hons) Optometry page. For more information about our range of courses within the School of Health Professions, please visit the school page.